Mao Soné just released the new video of his solo performance. The song, "A Letter", is that he wrote recently for his grandma who passed away couple years ago. The 2nd part of the suite has released. The suite: “Expressions On The Melody Of Kokiriko” is a composition of Mao Sone, that he was trying to identify and substantiate memories of his childhood of the landscape and the sounds of Toyama, the place where his grandpa and grandma live. This song is a suite formed from five different sections; Prelude, Recollection, Landscape, Grandpa’s Garden, and Journey. Mao used the elements including grooves, motif, and texts from the traditional folk song called “Kokiriko Bushi”. You can still watch the part 1. If you haven't checked the part 1, you can still watch on YouTube. The rest of the part of the suite will be released soon as well... Stay turned. Mao Soné joined in the new music video of great Japanese female drummer, Misaki Nakamichi. Misaki and Mao collaborate to compose and arrange this new song. 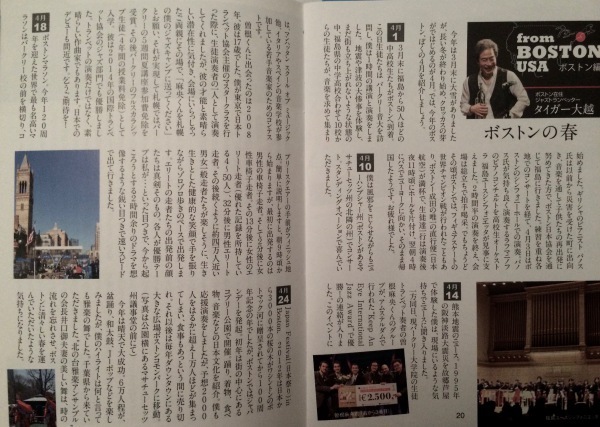 Mao Sone's mentor, Tiger Okoshi wrote an article about Mao in Hamamatsu Art and Music News "Art's". "4/14 - I heard the news about the Kumamoto Earthquakes. As a person who experienced The Great Hanshin earthquake in my hometown, Ashia, I felt like I was in Kumamoto when I heard the news. On the other hand, Mao Sone, a trumpet player currently attending the master's program in Berklee College Of Music, emailed me that he won the 1st prize at 'Keep An Eye' International Jazz Award in Amsterdam. In this competition, Groups from Manhattan School Of Music, music school from Spain and Italy participated as competitors. I met Mr. Sone in 2008, and he was 17 years old. It was the time I was a clinician at the workshop organized by Japan Trumpet Association in Tokyo, he was a student who was chosen to perform at the workshop. I found Mao's talent and his potential, and I immediately asked his parents to send him to my jazz camp in Sapporo. Then, Mao came to my jazz camp, and he won the Berklee Award with the full scholarship to attend the Berklee Five-Week Program. He attended as a full-time student with a full scholarship for 4 years. He won the 1st prize at the International Trumpet Guild Jazz Competition. He is not only a great trumpet player but also a fantastic composer. He is going to debut in Japan soon. Please keep an eye on him." 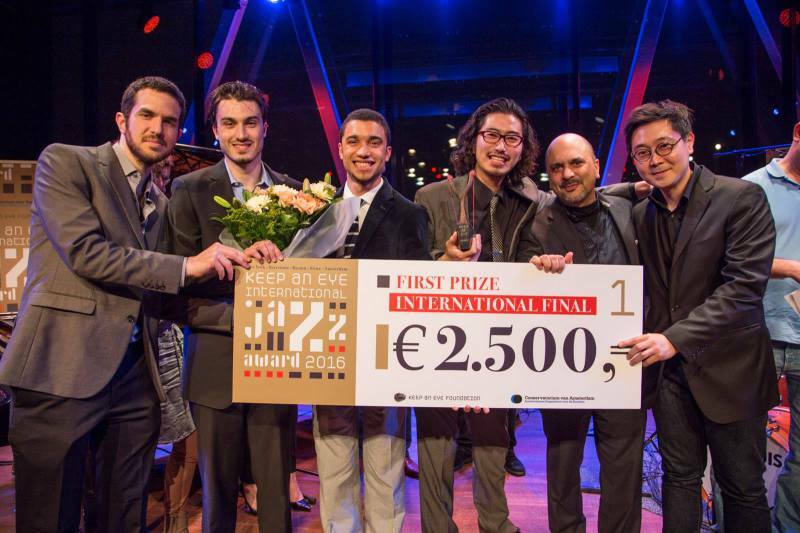 The Berklee Global Jazz Ambasodors, of which Mao has been a part for 3 years, won the competition in Amsterdam. The group is formed by the five finest young musicians from all over the world. Edmar Colon - a Puerto Rican saxophhonist, Noam Isreali - an Israeli drummer, Isaac Wilson - an American pianist, Suengho Jang - a Korean bassist, and Mao Sone from Japan. The picture was taken right after the competition, at Bimhuis in Amsterdam with Marco Pignataro, a saxophonist, a manager of the Berklee Global Jazz Institute.